Fairlands Valley Spartans organised the Stevenage Half Marathon and it was a tremendous community event with nearly 500 people running round the town, dozens of Spartans volunteering to make the event a success, a local Spartan winner, hundreds of spectators around the course and still 29 members of the club racing and doing well. Spartan GRANT RAMSAY won the race in 1 hour 17 minutes 26 seconds with the club’s team of Grant, STEFFAN FORD 1:24:16, BRIAN WHITE 1:28:23 and ADRIAN BUSOLINI 1:29:21 taking the team honours. Grant was also the first finisher aged 40 plus and Brian second 60 plus finisher in the open race. 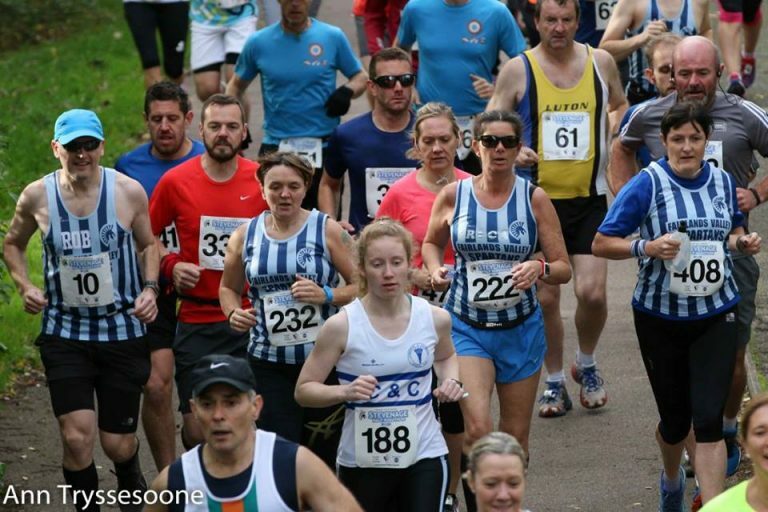 The event included the Hertfordshire Half Marathon Championships for veteran runners. Grant took GOLD. BRIAN WHITE took GOLD and JIM BROWN 1:46:31 BRONZE in the 60 plus category. ROB SHAW won BRONZE in the 70 plus contest. The Spartan veterans Grant Ramsay, Steffan Ford; Brian White and Tim Saban in a new personal best of 1:31:25 won GOLD in the county team event. The club’s women were not being left out as ROS INGRAM 1:54:22, JULIE SHADBOLT beating two hours for the first time with 1:58:48; and ERICA GRAYSON 2:02:29 made up the SILVER medal winning team. Many other Spartans had great races. NICK GILL put in a huge effort on the undulating course to take ONE second off his personal best (PB) which is now 1:37:53. There were also personal bests by KAREN ELLIS 1:51:48 and JO BOWDERY 1:57:44. Massive thanks to SOPHIE COWAN, race director and her huge team of volunteer race makers. 1 GRANT RAMSAY 1:17:26 Race Winner. GOLD team. 11 STEFFAN FORD 1:24:16 GOLD team. 30 BRIAN WHITE 1:28:23 County GOLD. GOLD team. 41 TIM SABAN 1:31:25 PB. GOLD team. 270 ERICA GRAYSON (F) 2:02:29 SILVER team. Six Spartans travelled to Portsmouth for the Great South Run. Racing over ten miles and with a big field RUTH REILLY ran a tremendous new personal best of 1 hour 14 minutes 44 seconds. JENNY GARRETT was rewarded with a new 1:29:59 PB. LIAM HERBERT was the club’s fastest finisher with 1:08:52. 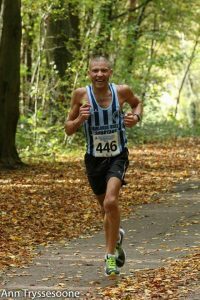 In a very windy Abingdon Spartan ANDREW PATTERSON cut his marathon personal best (PB) by five minutes to 2 hours 42 minutes 20 seconds. That gives him a championship start at the London Marathon. SUZY HAWKINS cut her PB to 3:21:50. CAROL PAUL ran the Toronto marathon. On a hot day for the time of year where Carol suffered in the heat Carol completed the marathon in 4:39:35 her sixth marathon in Canada and her 355th marathon. Carol ran her first marathon 25 years ago at Snowdon. Fairlands Valley Spartans campaign in the new season’s cross country league starts in Cheshunt at 11a.m. this Sunday, 29th October. Fastest Spartan parkrunner of the week was RICHARD KENNEDY who was 7th finisher in 22:45 in the inaugural event of Nobles parkrun on the Isle of Man. Fifteen Spartans lined up at Stevenage. MARK BEASLEY finished 36th in 23:33 with LEE PICKERSGILL next Spartan in 24:18 followed by ANDY JAY in 25:10. DANIEL SUTTON (25:22), DAVID SCOTT (25:44), ROGER BIGGS (30:27), JAMES SOUTH (32:00) and SELVAN NAICKER (40:13) also ran with IAN ALEXANDER volunteering as tailwalker in 44:33. VERITY FISHER was 10th woman in 25:30, with TRACY PEZ (27:55), LIZ GUEMACHE (29:56) and SALLY PHILLIPS (30:07) also finishing in the top 50 women. TRACY STILES (32:42) and LYNSEY CHALKLEY (35:49) also ran. In other parkruns around the country DARYL STEVENS headed north (for him!) to Basingstoke to compete in 42:19. HANNAH NEALE (20th, 26:02) and ALEXANDRA WHITEHOUSE (34:24) were both in action at Bath Skyline, and NEIL ROBINSON (16th) ran at Westmill in 27:08. Finally TIM ROBINSON was 15th at Pymmes in 24:00. Serpentine 25th Anniversary 5K from the boat house, Hyde Park on Friday 27th October. First Cross Country League race at Cheshunt on 29th October.